Take a look at the newest edition of our Request-fest, featuring brilliant design ideas -- all requested by you! The variety of styles and sizes is amazing! 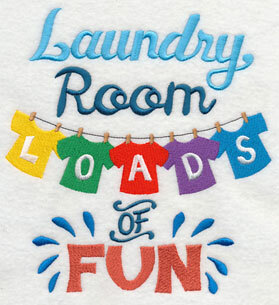 Show your love for flowers with frangipani and cone flower designs, or add a hint of fun and color to your laundry room with sweet and sassy samplers. 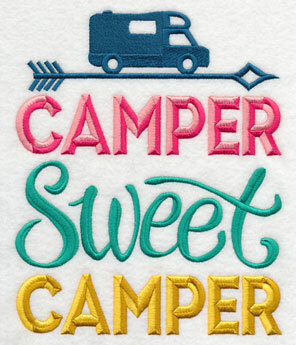 New variations on "Home, Sweet, Home" for campers, trailers, and barns will amp up your embroidery, back-to-school clotheslines are perfect for your favorite student or teacher, plus all-new pickleball designs are perfect for updating sports gear. 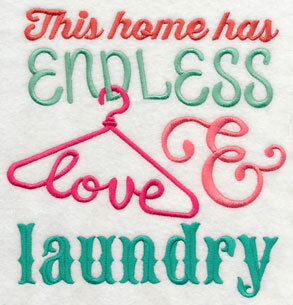 Scroll down the page to find all these exciting new designs and more! 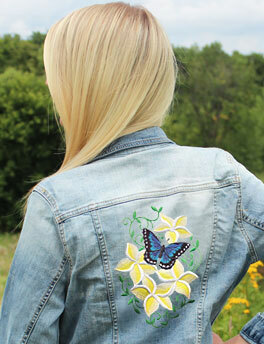 Beautiful butterflies and frangipani are great for stitching on jacket backs! Frangipani, also known as plumeria, is a stunning flower native to tropical regions. 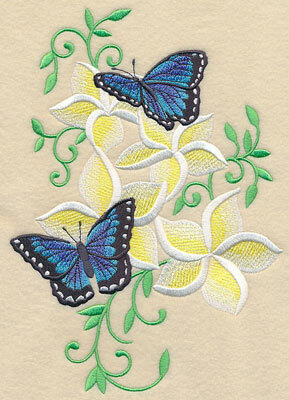 Janine loves the pretty flowers, and requested a series inspired by the butterflies that flock to these fragrant blooms. We thought the idea was brilliant -- thanks, Janine! 6.90" x 9.55" and 5.86" x 8.11"
5.31" x 7.35" and 4.85" x 6.71"
6.89" x 9.71" and 5.86" x 8.26"
5.31" x 7.49" and 4.86" x 6.85"
Frangipani trees are well known for their gorgeous flowers because they are commonly used to make leis, or floral garlands. 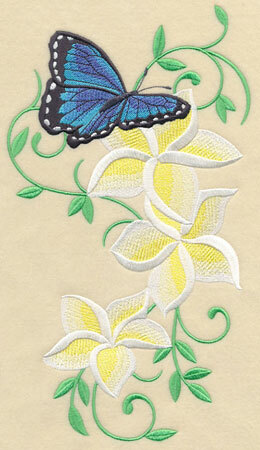 These designs feature the flowers in clusters instead to show off their beauty. 6.88" x 10.79" and 5.85" x 9.18"
4.97" x 7.79" and 4.38" x 6.86"
6.63" x 11.71" and 5.32" x 9.39"
4.42" x 7.79" and 3.86" x 6.81"
Stitch the designs as additions to apparel, towels, quilts, pillows, and more! 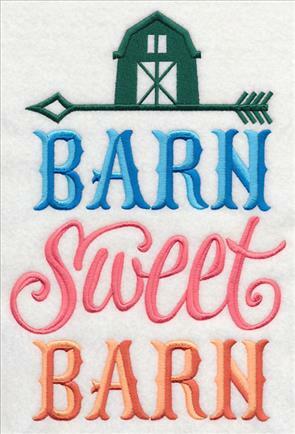 This horizontal border designs is especially gorgeous when added to a pillow case, placemat, or tablecloth. 11.74" x 4.48" and 9.39" x 3.58" and 7.79" x 2.97" and 6.00" x 2.48" and 3.85" x 1.59"
Stitch all the fluttering frangipani designs on one project, like a linen set or quilt, or pick your favorite and stitch it alone. 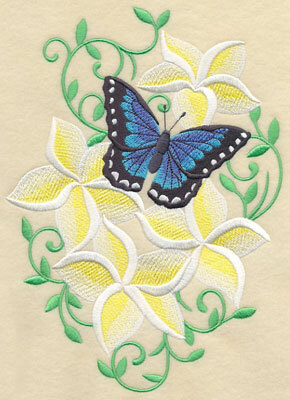 The beautiful blue butterflies are the perfect way to add a pop of color to your embroidery projects. 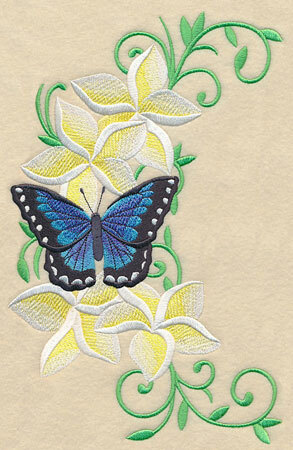 5.14" x 11.71" and 4.11" x 9.37" and 3.41" x 7.78" and 3.00" x 6.84" and 1.71" x 3.88"
Stitch these fluttering frangipani designs on a variety of projects. Get all six designs in a pack by using the links below. The red-spotted butterfly is deeply meaningful to Barbara's family. It has come to represent a grandson who passed too soon. 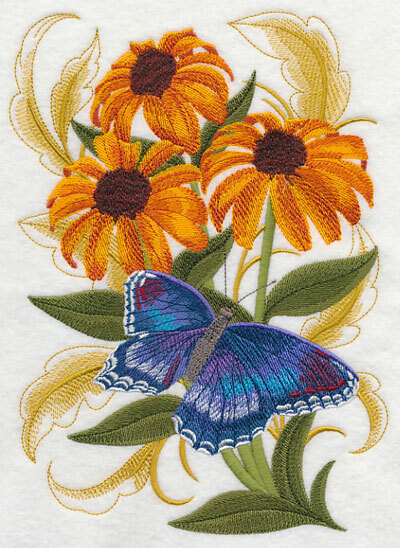 We were honored to create this design featuring Paxton's butterfly fluttering amongst cone flowers in memory of their lost loved one. 6.87" x 9.67" and 5.53" x 7.78" and 4.88" x 6.87"
Beverley loved the style of our Farm Sweet Farm design, and was hoping we could create versions for her camper. 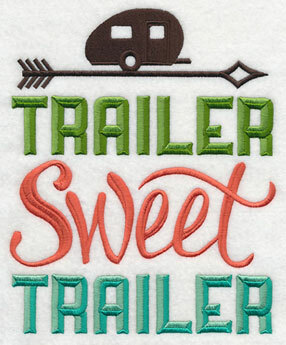 Here a trailer and a camper get a touch of home with these sampler designs. 6.90" x 8.31" and 6.21" x 7.47"
5.86" x 7.05" and 4.83" x 5.81"
6.90" x 8.34" and 6.21" x 7.51"
5.86" x 7.08" and 4.83" x 5.83"
Susan also loved the Farm Sweet Farm design, but requested a version featuring a barn instead. She knows friends who live in a house converted from an old barn, and thought the design would be a sweet addition to their home. 6.90" x 10.11" and 5.86" x 8.58" and 5.33" x 7.81" and 4.68" x 6.85" and 2.64" x 3.86"
Megann is a big fan of our current clotheslines designs and thought it would be a great addition to include a few back-to-school options, too. 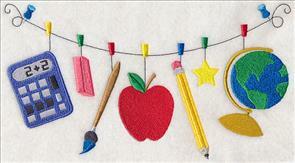 Here is a classic version featuring traditional school supplies -- stitch it on shirts, bags, and fabric book covers. 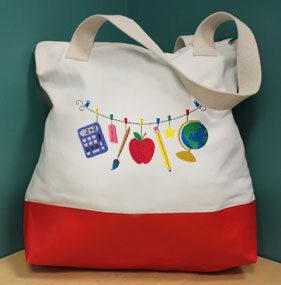 A tote bag becomes the perfect go-to for carrying books and papers with this fun embroidery design. 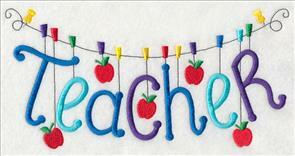 9.38" x 5.18" and 7.77" x 4.29" and 6.85" x 3.78"
Clotheslines featuring school doodles and a "Teacher" motif are great when stitching for back-to-school. They make wonderful gift ideas for the students and administrators in your life. 9.38" x 4.65" and 7.78" x 3.86" and 6.85" x 3.39"
Gretchen's son loves the ever-adorable Fennec fox, which is known for its small stature and big ears. Fennec foxes are native to the Sahara of North Africa, and are uniquely adapted to survive in high-temperature desert environments. 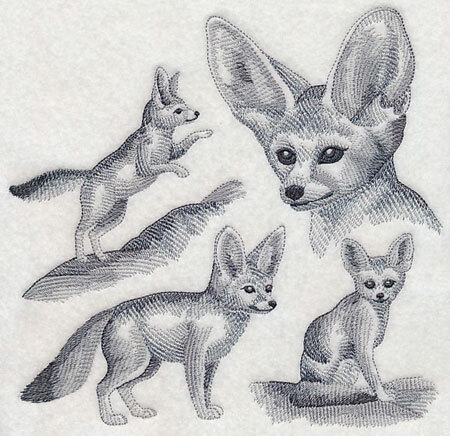 In this design, the Fennec fox is shown in four poses -- perfect on tote bags, sweatshirts, and more. 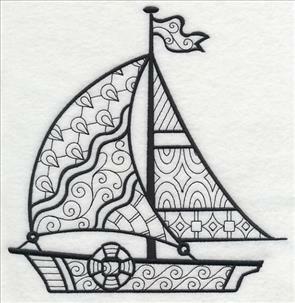 7.82" x 7.52" and 7.19" x 6.90" and 6.10" x 5.88" and 5.09" x 4.87"
Ann requested we add a sailboat to our growing collection of blackwork designs, and we loved the idea! 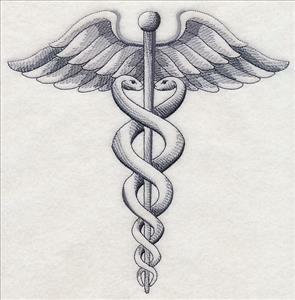 Two different versions were created -- one with pops of color, and one in the basic blackwork style. 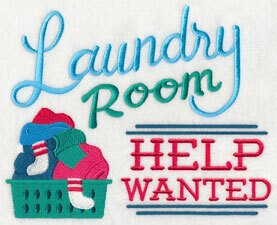 Stitch them on beach towels, tote bags, and apparel! 7.80" x 6.72" and 6.80" x 5.86"
7.61" x 7.81" and 6.90" x 7.08"
5.85" x 6.01" and 4.84" x 4.97"
Sherry is a fan of our lighthouse designs and was hoping we would add the South Haven Light to our list. 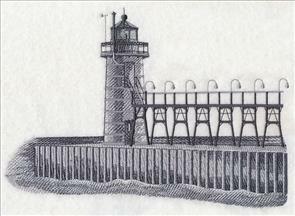 This Michigan-based lighthouse was built on the entrance to the Black River on Lake Michigan in 1872, and is still operational today. Stitch the majestic building in color, or in sketch-style. 9.74" x 6.90" and 8.26" x 5.86"
9.76" x 6.90" and 8.31" x 5.85"
7.80" x 5.52" and 6.88" x 4.86"
Joanne suggested a few designs for the laundry room, and we couldn't get enough of the fabulous idea! 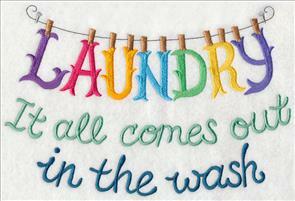 Each of these samplers are perfect for hanging above the washer and dryer or stitching on a laundry bag. 5.86" x 6.01" and 4.85" x 4.97"
6.90" x 7.27" and 5.86" x 6.13"
4.84" x 5.08" and 3.67" x 3.85"
Add a bright and colorful look to your laundry room with this clever quote. 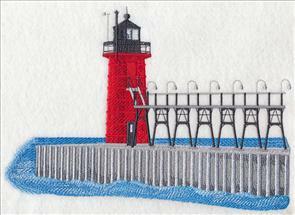 The vibrant embroidery design is a great choice for fabric hampers, wall hangings, and more. A framed piece is a great way to show off these beautiful samplers. 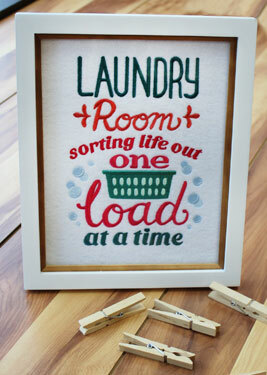 Hang them in your laundry room for a kick of humor and color. 6.90" x 9.73" and 5.54" x 7.81"
4.85" x 6.84" and 2.74" x 3.86"
Frame a couple of your favorite samplers together to create one gallery wall, or pick your favorite to stitch and hang alone. 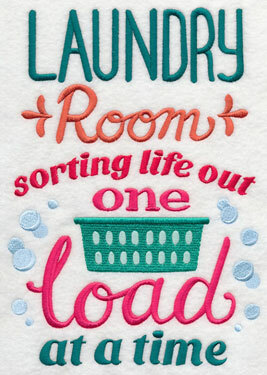 Either way, these laundry room designs are sure to perk up your space. 8.47" x 6.90" and 7.81" x 6.36"
7.19" x 5.86" and 5.94" x 4.84"
10.31" x 6.90" and 9.41" x 6.30"
7.81" x 5.23" and 6.88" x 4.60"
Let these fun embroidery designs spruce up your laundry room. The design on the left is the perfect reminder to "check your pockets"; the shadowbox on the right features classic laundry motifs. 6.90" x 8.99" and 5.86" x 7.63"
7.41" x 6.90" and 6.30" x 5.86" and 5.20" x 4.84"
Pam was looking for a design to deck out the tote bag she carries her pickleball paddle in. She was especially inspired by our retro sports designs, including the Bowling a Strike, Hole in One, and For the Love of Tennis design packs. 8.23" x 6.91" and 7.39" x 6.21"
6.98" x 5.86" and 5.74" x 4.83"
7.81" x 7.43" and 7.25" x 6.90"
6.17" x 5.87" and 5.11" x 4.86"
A pickleball paddle border is a funky addition to your sports bags, towels, clothes, and more! 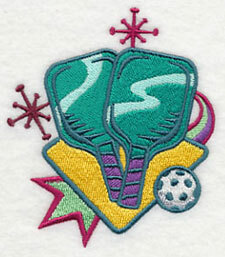 The bright colors and retro imagery are a fresh approach to stitching for the sport. 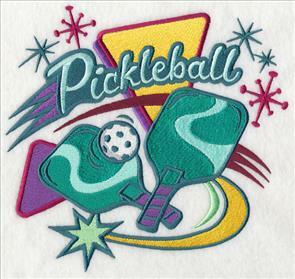 11.74" x 3.99" and 9.41" x 3.20" and 7.81" x 2.66" and 6.00" x 2.29" and 3.87" x 1.51"
These single pickleball designs are great for stitching on shirt pockets, towel edges, athletic jackets, and more. 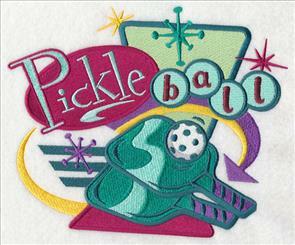 Celebrate the sport of pickleball with a series of retro designs! Pick your favorites using the links above, or get them all together in a design pack. 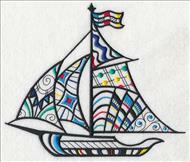 Marie loves our existing Peace, Love designs and suggested we add one to celebrate pickleball! 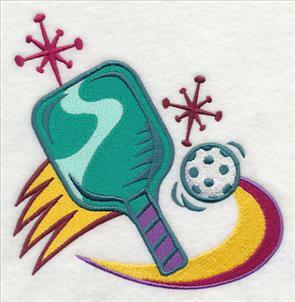 This design features two crossed pickleball paddles and a pickleball. 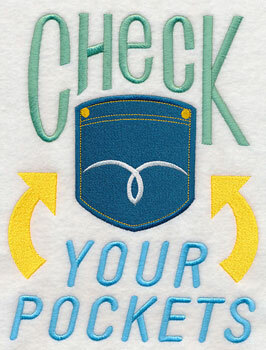 Stitch it on t-shirts, gym bags, and more! 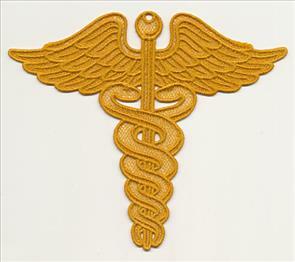 9.42" x 3.75" and 7.82" x 3.11" and 6.87" x 2.73" and 5.25" x 2.19" and 3.88" x 1.64"
Sharon is a registered nurse and was looking for a few designs featuring the caduceus to embroider on shirts for friends and coworkers. 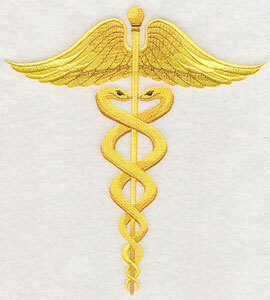 Here we offer three different versions of the classic medical symbol: stitch-filled, sketch-style, and freestanding lace. 6.88" x 7.57" and 5.85" x 6.44"
4.84" x 5.33" and 3.50" x 3.85"
5.87" x 5.85" and 4.89" x 4.87"
A freestanding lace version of the caduceus is a unique take on embroidering the medical symbol. 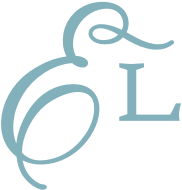 For instructions on stitching freestanding lace, click here. 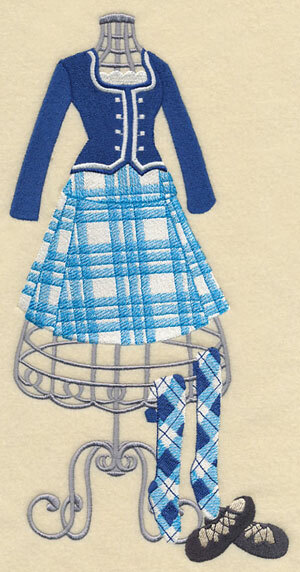 6.99" x 5.89" and 5.78" x 4.87" and 3.90" x 3.29"
Louise couldn't get enough of how our Irish dance dress form turned out, and requested a similar design featuring Scottish highland dance costumes. 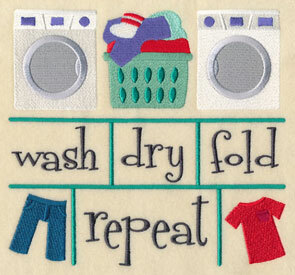 Stitch the fashionable design on tote bags, pillows, mini-quilts, and more. Thanks for the suggestion, Louise! 6.13" x 11.74" and 4.91" x 9.39" and 4.07" x 7.78" and 3.59" x 6.85"